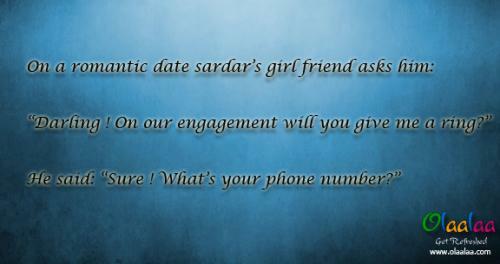 On a romantic date sardar's girl friend asks him: "Darling! On out engagement will you give me a ring?" He said: "Sure! What's your phone number?" "Darling! On out engagement will you give me a ring?" He said: "Sure! What's your phone number?"